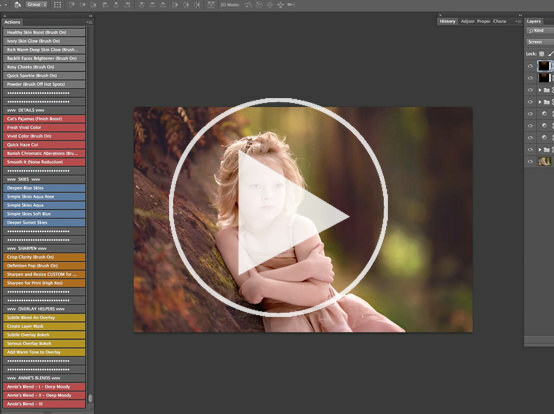 Photoshop actions to create lush looks – rich, jewel toned color pops to soft, dreamy effects. 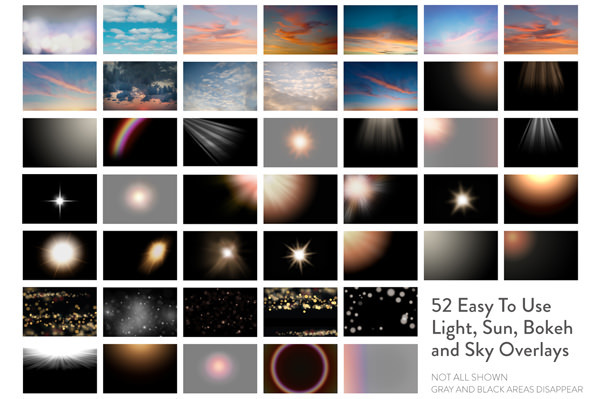 Easily add artistic light and pretty skies. 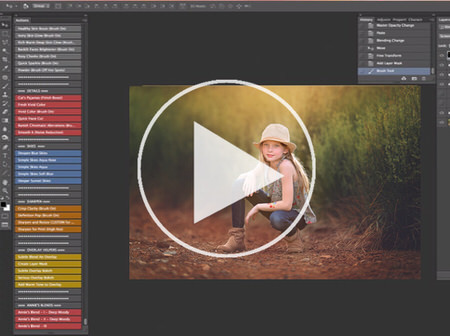 All-in-one workflows, Outdoor and Beach mega actions, color toning, bokeh and portrait enhancers. Scroll down to read raving REVIEWS! From rich and dramatic jewel-toned color pop, to soft and dreamy, the Reverie Collection Photoshop Actions will bring your vision to life. Designed with outdoor photography and location images in mind, Reverie easily solves common challenges from lighting issues to color casts, enhances backgrounds and subjects, offers perfect finishes, and more — all within a completely customizable, streamlined workflow. Get spectacular effects for creating beautiful tones, lush color, and unique finishing touches. 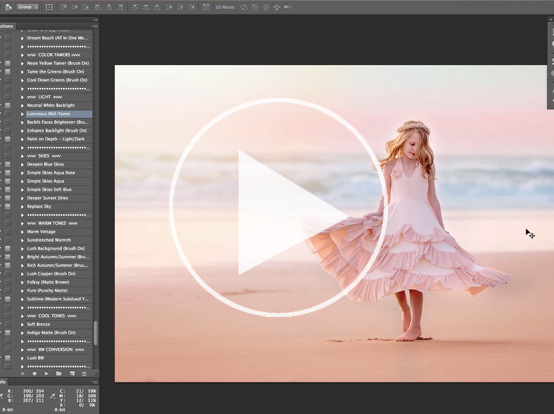 Reverie is perfect for effortlessly editing portrait, wedding or landscape photos. These innovative tools are perfect for all types of locations – the country, the city, the woods, the beach, the mountains and anything in between – even studio photographers love Reverie! Spend less time editing and more time doing what you love. Powerful and flexible for the advanced professional, yet easy and intuitive for beginners. Learn how to get stunning effects with 12 video tutorials and a 50 page "recipe" guide book for inspiration. Easily address difficult outdoor and on location challenges, add creative touches and get the perfect finish. Bring vivid color to drab skies, create beautiful soft bokeh, and add stunning dimensional light. Turn your vision into reality every time. Reverie actions are meticulously layered and non-destructive for easy and complete customization. Add a secret dash of magic that is uniquely you. Creating the look you’ve envisioned in your mind’s eye is now a piece of cake. Discover the power of the All-In-One base actions – your complete workflow in one click. From the “works-with-anything” Clean Primer Base to the specialty Outdoors and Dream Beach mega actions – get ready to create breathtaking edits! Easily address outdoor issues: add the fill light of a reflector, brush off annoying green or yellow tones, instantly bring back the zing to a hazy, back-lit photo or add a moveable glow of sunlight. Make your subject pop off the background with specially designed edging actions. Enhance bokeh and blur in your backgrounds with tools to add simple softness or enrich your photos with a velvety, smooth look. Do quick portrait touch-ups: add a healthy glow to all skin types, paint on rosy cheeks and sparkly eyes, or quickly brighten faces up. Add lush toning or a dash of subtle color to perfect your image. Achieve a perfect matte or film finish — from delicate films to bold, vibrant matte finishes. End the search for your perfect “go-to” black-and-white with myriads of options to add special touches and transform your photo into a flawless black and white with amazing depth and detail! Transform drab or blown-out skies with pretty color using the sky actions, from soft aqua and rose to vibrant sunset hues. 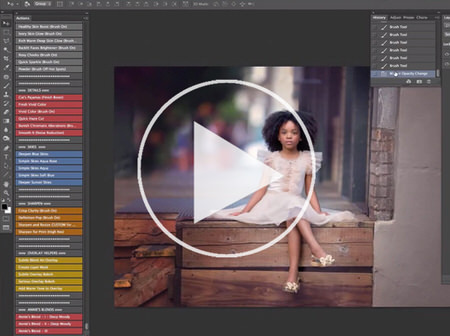 Create looks that Annie uses regularly in her own editing with the Annie’s Blends actions: unique combination recipes for two versions of Deep Moody edits, Backlit images and a Vivid Matte. Create colorful, vivid skies: from sunset to pastel clouds, totally transform images with sky overlays. Create a masterpiece with dimensional light, sun and bokeh overlays. Quickly add a glow of sunlight, some dramatic sunbeams or a even a whimsical rainbow – so many options, from subtle and realistic touches to magical and dramatic! This is my first purchase from Paint the Moon and I cannot tell you how impressed I am with the quality and versatility of these actions. From the extensive documentation to the little notes that pop up when running some of the actions that cue me on what to do, it’s obvious that you put many hours and much effort into creating them. These are the best actions I’ve ever purchased! Within literally minutes, I had transformed one of my photos into something special. I can’t wait to experiment more with them! Thanks so much, Annie! You are always an inspiration and these actions allow me to give my clients beautiful photos without having to spend hours editing. WOWZER… I just fixed my blown out sky with the Reverie action set. In minutes. I have spent so much time trying to fix these!!! You’re a genius – seriously! Thank you for making it possible for people like me to be creative without losing all my hair and sleep!!! At the risk of sounding like a stalker—I have to say—you’re like, my favorite person right now. If I knew you, I’d hug you. I just have to take some time to THANK YOU for your AMAZING work. Because of you, my work is now better. I recently purchased your Reverie Collection of actions because I fell in love with your before and after shots. The options are endless with this collection and the workflow that you have set up on it is SO easy to follow. THANK YOU AGAIN! I had so much fun this afternoon using the actions and overlays of Reverie. I took a very ordinary photo and made it POP—literally! Thanks again for coming to my rescue. I look forward to the new creative journey this beautiful set of actions will take me on. It is apparent that you’ve put an incredible amount of effort into your work. Your attention to details is amazing! And each action I’ve tried thus far–works flawlessly! Annie … I bought your Reverie actions a month ago to edit an outdoor, sunny wedding. Wow!!!!! I have other actions, but yours are so superior and easy. And the b/w conversion is perfect. Thanks for all your work and expertise. I’ve had the actions less than 48 hours it does everything promised…and more! I can’t wait to see where this propels my business. Thank you, Annie. Not just for the hard work that went into creating these, but also for your stellar customer service during, and after the sale! I love your actions! Thank you they’re giving me the style I’ve longed for and never been able to achieve on my own before now! Best editing decision I ever made was buying the Reverie Collection. It is amazing in every way! Annie, I wanted to thank you so much for creating the Reverie actions. I used it today (finally had the chance at the beach!) and I am in awe. Your work does not go unnoticed by any means and I am so thankful for your photoshop actions. THANK YOU!!! I want to tell you how much I love the Reverie collection actions. I feel it has taken my photos to a whole new level. Thank you very much for all your work! I have been going back over older photos using Reverie Actions and LOVE it!! It makes editing so much smoother and brings the photos to life…thank you so much!! Oh…using it on my present sessions as well and this is taking my photos to the next level, when I compare the photos that I thought “looked” good and clients bought and then compare them to the re-edited ones with Reverie…there is no comparison…again…Thanks so much, they are SO my go to actions from now on!! I just wanted to thank you for the beautiful and easy to use Reverie actions. I purchased Reverie after weeks of looking into different actions. I wanted something that would streamline my workflow and take my work to the next level. I am so impressed with all of the beautiful options, and it’s clear how much care and thought you put into the included guides. You have literally changed the way I am able to work and produce images! I started following the recipe book you have for the Reverie Actions and my goodness it’s amazing how much they help my editing. I mean I never thought my images could look this great. So happy I bought the Reverie Collection. Best decision ever! I have spent the past day playing with your actions and I am in love!! They’re so easy to use and they’re the best purchase I have ever made!! Annie, Thank you so much for the wonderful Reverie Actions. It helped create beautiful, artwork like workflow my first time using it. I’m feeling proud and confident now. I LOVE your PS actions, it saves me so much time and makes my photos brighter, magical and more awesome, thanks for that dear Annie! I just wanted to tell you that the Reverie Actions are AWESOME! I bought actions elsewhere last year and never used them because they were complicated or just didn’t look right. I was looking for an action set for a beach shoot I did and came across your site and I am so glad that I took a chance! Your actions and the instructions you give are wonderful. Keep doing what you do as I am sure I will buy more from your collections. Thank you! YES YES YES! I love the Actions. Fastest and easiest editing I’ve ever done. Awesome product. Thank you! I just want to say THANK YOU! I purchased the Reverie Actions just recently and it’s been such a game changer, and time saver! I’ve been playing around with the actions for about 15 minutes and can’t believe I didn’t buy this sooner!! Thanks, Annie! I did my first application using Reverie actions on a photo, and I am giggling. I usually spend so much time in editing and enjoy the art and challenge, but these actions add way more to what I can do in Lightroom. I feel like I have gotten my first box of crayons all over again! Appreciation to the moon and back! Reverie has completely changed my life, my portraits have real emotion now! So happy I found PTM. I had such drab edits before and SO time consuming – Paint the Moon has been a total game changer 🙂 Thank you again for everything! I just edited my first client session with your tools and it made the process SO MUCH faster than how I was doing it before! Wish I had bought your tools years ago. Thanks! Ultimate portrait retouching set for creamy, smooth skin, eyes that sparkle and perfect skin tones. Includes beautiful, powerful Complete Makeover actions plus essential workflow tools for clean, sharp photos. Turn your photos into art with powerful clean edits to pop and brighten, with an array of actions to add unique artistic tones and hazes. Includes All-In-One black and white actions, plus color base edits.